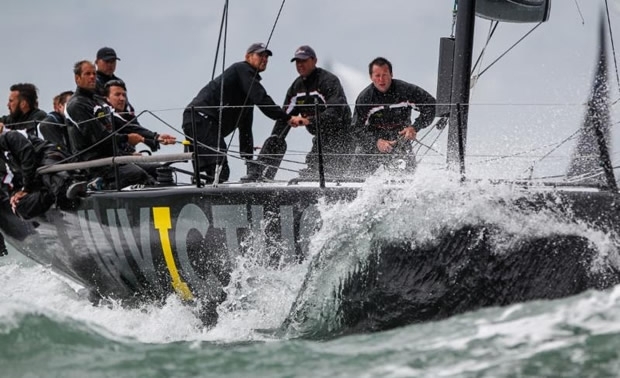 With the southwesterly wind gusting to more than 25 knots, the RORC IRC National Championship kicked off with three lively races in the western Solent for the 45-strong fleet. Principal Race Officer, Stuart Childerley selected a mixture of tight round the cans racing and windward-leeward courses, testing the mettle of the fleet. Piet Vroon's Ker 51 Tonnerre 4 leads the class scoring two bullets and a third. Michael Bartholomew's GP42 Tokoloshe II was in the hunt, equalling Tonnerre's score going into the last race. However, Tokoloshe II was too eager to start Race 3 and, OCS, had to go back to start correctly. Sir Keith Mills' new Ker 40+ Invictus is in third position just a point ahead of Anthony O'Leary's Ker 40 Antix. Multiple world champion Jeremy Robinson, tactician on Tonnerre 4 commented: "That was brilliant racing for us today. The tough conditions suit the way Tonnerre is set up. She is an offshore boat and sails well in 20 knots; full-on downwind. On top of that, the manoeuvres on board were good all day. Race two was our worst result but that was because we got a layline wrong. In this fleet, I would have taken a 1-3-1 this morning for sure. "The RORC Race Team did a good job today, initially when they told us we were going to the Western Solent, I was not too happy. I thought it would be a very one-sided course, but the racing today was superb - we were wrong and they were right." Steve Cowie's all-Scottish team racing the First 40 Zephyr won two of today's races to top this highly competitive fleet. A great start in the first race was rewarded by a win for Zephyr and that was followed up by a second victory by just four seconds on corrected time ahead of Alice. Simon Henning's Mumm 36 Alice won the last race of the day to trail Zephyr by a single point after three races. Jim Macgregor's Premier Flair IV is third, just a point and a half ahead of RORC Commodore Michael Boyd and Peter Rutter's Grand Soleil 43 Quokka 8. Volvo Ocean Race sailor, Ian Budgen, tactician on Zephyr said: "It was an eventful day, especially when the tide turned and the waves got bigger. This coupled with some strong gusts coming through caused a lot of boats to Chinese gybe. We saw 28 knots and steep Solent chop and the combination made for very difficult conditions. Having said all that, it was a really good day for us. We got good starts and got around cleanly. The strong wind suits the boat and we kept things together, although we came close to spinning out a few times! Like me, the whole team comes from the West Coast of Scotland and we have known each other for a very long time, which makes it a lot of fun." The best set of scores for the day belonged to Peter Morton's JND 35, Salvo, the scoreboard reads three straight bullets in IRC 3 but two of the races were won by less than a minute after time correction and another race was saved by accepting a penalty from a near rival, Hot Cookie. Neal Martin's Sunfast 3600, Hot Cookie is in second place, just a point ahead of J/35 Bengal Magic, sailed by James Chalmers. "Room for improvement" suggested a reserved Peter Morton, owner of JND 35 Salvo, having won all three races: "We infringed on another boat in the second race and we did our turns, so we had to come back from that. We have got to do it all again tomorrow, but I can't ever remember scoring three IRC bullets in a day in all the boats I have had over the years. I love it up in the Western Solent; it is more fun and there is more room and scope for setting different courses, especially with the wind angle we had today." Three more races are scheduled for Saturday 18 July. Lighter winds from the southeastern quadrant are forecast with significant tide, which should make for a tactically challenging second day on the water.